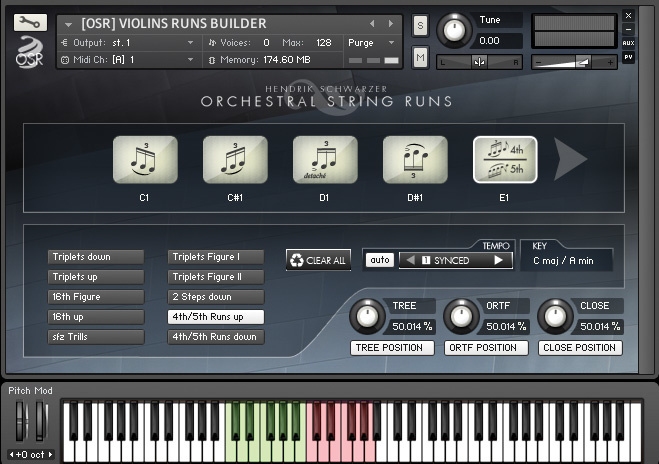 The quality and variety of orchestral string libraries continues to grow. Which one best suits your needs? When Miroslav Vitous released his Symphonic Orchestra Samples CDs in 1993, no–one could have predicted the avalanche of similar products that was to follow. 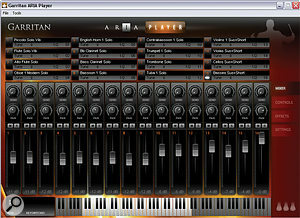 The ’90s saw a steady trickle of Akai–format orchestral libraries, but with the advent of the PC–based Gigastudio in 2000, the trickle turned into a torrent. Gigastudio is now defunct, a software success story turned sour; nowadays, sample developers tend to favour the ubiquitous Kontakt sampler format, or they use proprietary player software which works only with their products. While these format shifts have greatly inconvenienced some users, they’ve done nothing to stem the flow of new strings sample libraries, a product line which has proliferated in recent years. As a result, deciding which library to buy can be a bewildering experience, and (as with all commodities) it’s sometimes difficult to separate fact from advertising hyperbole. To throw some light on the subject, we’ve compiled a selection of the current sample libraries and virtual instruments which feature orchestral strings, and analysed their contents and characteristics. The majority of these titles have received in–depth SOS reviews, which can be read online via the links in the ‘SOS Reviews’ box. We hope our analysis will help you decide which orchestral strings library is best suited to your music and budget! This round-up focuses on stand–alone strings libraries dating from 2002 onwards, most of which incorporate ‘interval legatos’ and round robins (see the ‘Legato Revolution’ box for an explanation of these terms). 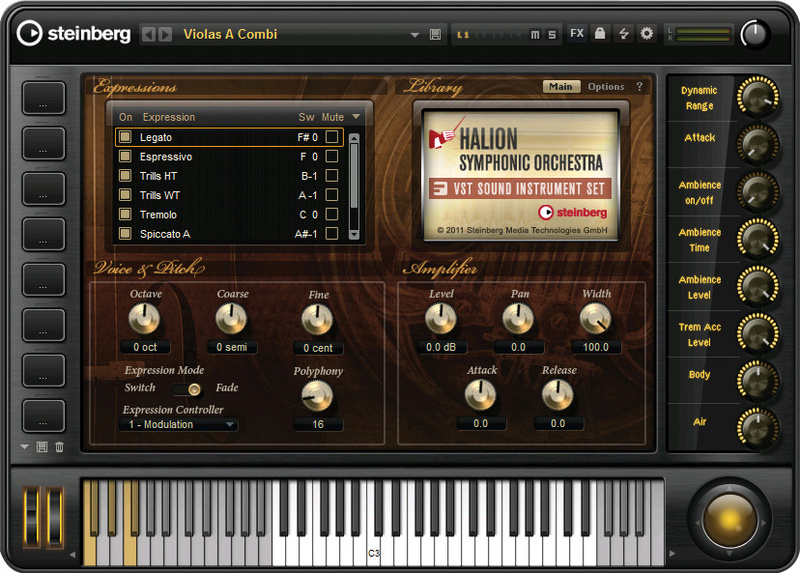 We’ve also included all–in–one symphonic products which feature strings along with other orchestral instruments. In order to make effective comparisons, single–instrument libraries which don’t comprise the whole strings family are excluded. 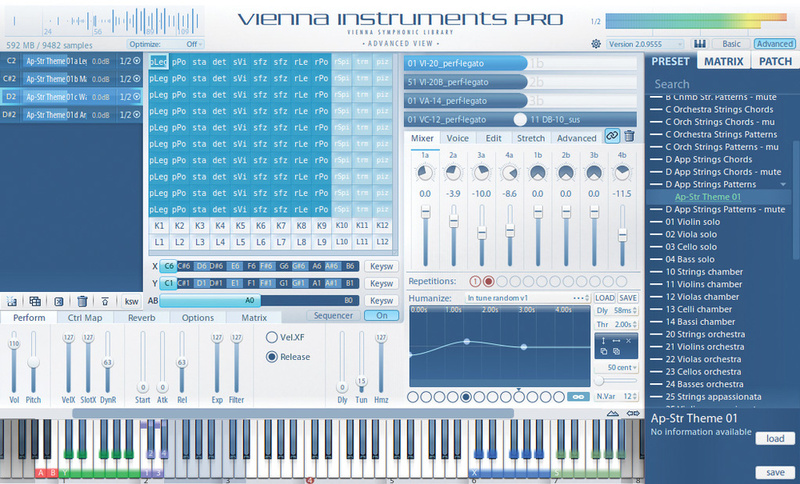 We’ll start with Vienna Symphonic Library, the world’s most prolific developer of orchestral sample libraries. Since 2002 the company have churned out over two million samples and countless instruments, winning a reputation for musical depth, detail and precision. 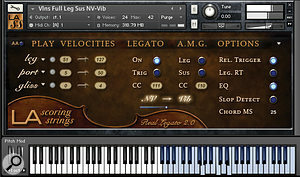 VSL libraries are powered by the Vienna Instruments sample player, which features a large, user–configurable patch–switching matrix and intelligent performance detection of legato intervals, note repetitions and playing speed. 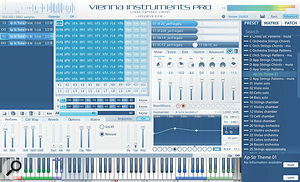 Vienna Instruments Pro adds more playing slots, convolution reverb, user–definable instrument ranges, a pattern sequencer and an auto–voicing feature. VSL have five full string collections, ranging in scale from Solo Strings’ quartet of solo instruments to the 56–piece Appassionata Strings. All feature the trademark Vienna legatos and a huge menu of articulations covering virtually every orchestral requirement, so mock–ups can be realised in forensic detail. Tailored for lush, romantic Hollywood–style scores, the Appassionata sections have a big, beautiful sheer sound and an expressive vibrato; if you need a lighter, more intimate and austere timbre, the small ensembles in VSL’s Chamber Strings work well for pop arrangements, or for adding detail to a larger ensemble. Each of these three libraries has a second volume containing muted con sordino articulations. The most versatile of the Vienna string libraries, Orchestral Strings I, includes 14 violins and 10 violas, while Orchestral Strings II adds eight ’cellos and six double basses. Though less lush than the Appassionata Strings, these ensembles perform a far greater range of articulations, and their aggressive sforzatissimo delivery outguns other VSL string titles. 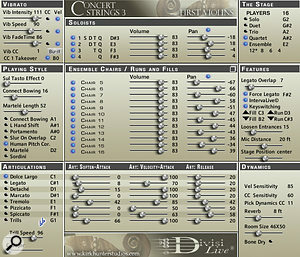 For more experienced users and control freaks, VSL’s ambitious Dimension Strings collection features 24 string players recorded in sections of eight violins, six violas, six ’cellos and four double basses, using individual microphones on every instrument and giving extensive, detailed control of each player’s performance. All these samples were recorded from one perspective in VSL’s Silent Stage, a custom–built facility with a controlled studio acoustic; to simulate a traditional orchestral hall sound, you’ll need to add reverb. Libraries are available in Standard (commonly used articulations) and Extended (extra articulations) versions. The latter option is installed along with the standard samples and remains active for a 30–day trial period, after which it can be unlocked by paying extra. VSL’s strings are available as individual collections, discounted bundles and in cut–down Special Edition volumes (see ‘Mixed Orchestral Instruments’ below for details on the latter). 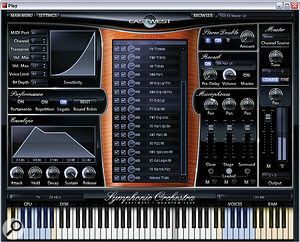 US company EastWest, one of the original sample-library pioneers, scored a hit in 2003 with the EWQL Symphonic Orchestra. While EWQLSO remains popular, recent years have seen a second wave of EastWest orchestral products: the Hollywood orchestral series. 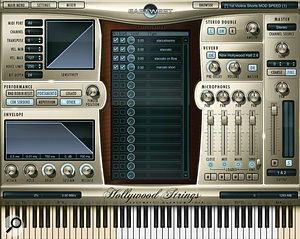 EastWest/Quantum Leap Hollywood Strings is an acknowledged industry heavy hitter: recorded from seven microphone positions in EastWest’s Studio 1 by engineer Shawn Murphy, the 312GB library contains full–blown symphony orchestra string sections totalling 57 players. It boasts a rich, full and opulent sound (I was particularly impressed by the ’cellos’ legatos) and a generous selection of short note deliveries optimised for driving, action–scene ostinatos; the spiccato/staccatissimo/staccato/marcato format has become something of an industry standard. ‘Mod speed’ instruments, which use the wheel to select the type of short note, are a useful programming aid. 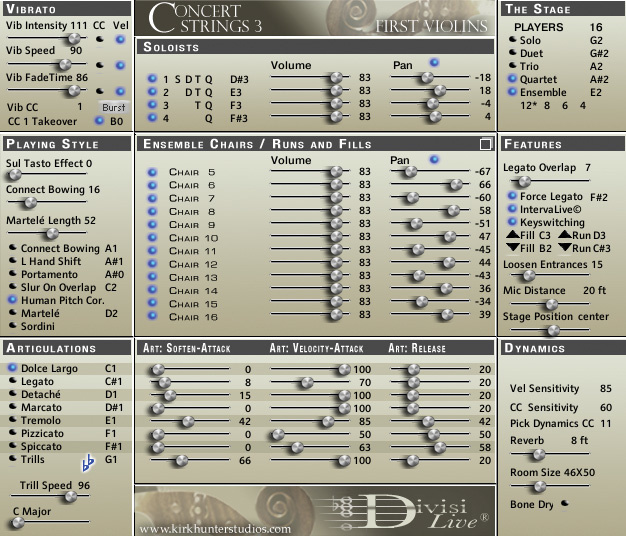 Hollywood Strings runs on EastWest’s proprietary Play sound engine, which includes a large menu of convolution reverb presets capable of transforming the library’s large–room acoustic into a concert hall sound. With some patches incorporating as many as 13 velocity layers, this collection can place a strain on your computer, so with that in mind, ‘light’ programs are available for those with less powerful systems. The library is available in Diamond (the full Monty, 24–bit), Gold (one mic position only, 16–bit) and Silver (one mic position, 16–bit, fewer articulations) editions. The latest development from EastWest is Composer Cloud, a subscription-based model that should make even their premium libraries accessible to almost everyone. Access to any seven virtual instrument collections costs €27.99$29.99 per month, while for €45.99$49.99 per month you can enjoy unlimited use of EastWest’s entire catalogue. Amidst storms, flooding and freak weather, one of the more pleasant surprises of Christmas 2013 was the advent of Orchestral Tools’ Berlin Strings. Part of an ongoing orchestral series, this dynamic collection features string sections recorded in the historic Teldex Scoring Stage from four microphone positions, plus a fifth mono spot mic trained on the principal violinist. Though of less than symphonic size, the sections make a big ensemble sound and the musicians play their legato intervals, expressive sustains (with three built–in vibrato options) and driving short notes with great energy and commitment. The sting in this library’s tail is the Bernard Herrmann–esque spiccato, a great resource for rhythmic writing. Around the same time, UK company Spitfire Audio continued their celebration of British musicianship by unleashing a 60–piece string orchestra recorded at London’s AIR Lyndhurst. Entitled Mural Symphonic Strings, this large group’s sound can be almost overpowering, especially when you dial up its reverberant ambient mikings. Highlights include lush high–strings sordinos and superbly sonorous ’cellos and basses, which thunder when layered in octaves. For the meat–and–potatoes styles necessary for general string writing, buy Mural Vol. 1; the companion set Mural Vol. 2 adds more specialised articulations such as trills, portamento slides and effects. Mural Ensembles maps Mural’s violins, violas, ‘cellos and basses into six-octave ensemble patches offering 13 essential articulations: a fine solution for those of us who like to play with two hands! In contrast to the big, undifferentiated symphonic string timbre most libraries aim for, Spitfire’s Sable Strings series features chamber–sized sections optimised for nuance, definition and detail. Sable Vol. 1 features first violins and a ’cello section playing essential articulations such as long notes, short spiccatos, staccatos and legatos, while Sable Vol. 2 adds second violins, violas and double basses playing the same articulations (with a few omissions). Sable Vol. 3 and the smaller Sable Vol. 4 introduce extended articulations for all five sections, while Sable Ensembles combines the five sections into full-range patches which cover a range of basic articulations. A full review of Sable Strings and Spitfire’s BML range will appear in a future issue of SOS. Mural and Sable Strings feature Spitfire’s ‘Ostinatum’ sequencer, a quick and easy way of creating repeated ostinato rhythm patterns. 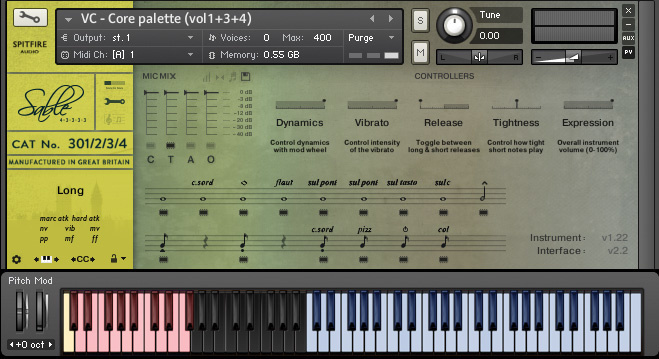 Both libraries require the full version of NI’s Kontakt 4.2.4 or 5, and will not run on the free Kontakt Player. 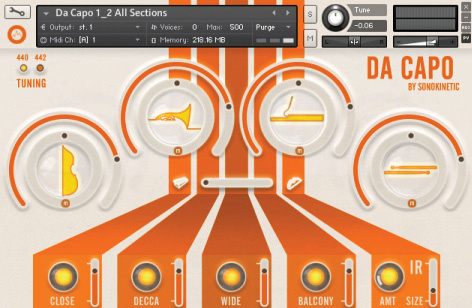 Back across the pond, another library of note is Audiobro’s LA Scoring Strings, aka LASS. Flexible section sizes are a strong point: ensembles are presented in a choice of full, half, quarter (two versions) and solo instrument formats, facilitating divisi writing and making it easy to create anything from a string quartet to a full 46–player arrangement. 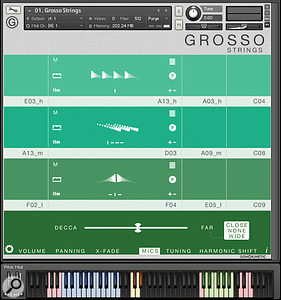 Since its release in 2009, LASS has steadily evolved: latest features include the Auto Rhythm Tool (which generates urgent rhythmic ostinatos), a ‘Stage & Colour’ page offering global control of the tone colour, stage position, reverb and delay effects of all loaded instruments, all–in–one patches incorporating sustain, legato, portamento and glissando, and an Auto Arranger, which automates part–allocation and voice–leading of chords across the different sections. 8Dio’s Adagio series also offers a degree of section flexibility: each of its volumes (Adagio Violins, Adagio Violas, Adagio Cellos and Adagio Basses) contains a full ensemble, a small chamber–sized group and a solo instrument, all recorded in a church in the San Francisco area. A major selling point is the number of different expressive legato and portamento styles, each with a subtly different character and offering various vibrato intensities. ‘Louré’ patches, featuring a continuous bowing with a subtle, built–in note reiteration, are now conveniently tempo–sync’ed; emotive played swells and dark, vivid sordinos add to the Adagio series’ romantic feel, but it also achieves drama with vigorous Herrmann–esque short notes, dynamic trills and powerful sustains. 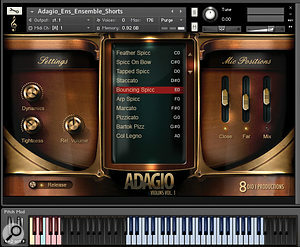 The Adagio collection is supplemented by Adagietto (a full string ensemble set based on the four Adagio volumes) and Agitato expansion libraries for violins, violas and ’cellos, which feature new, grandiose legato styles optimised for soaring, melodic lead lines in the John Williams vein. These libraries require the full version of Kontakt 4.2, with Kontakt 5 recommended for tempo–sync’ed patches. Started in 2007 by two composers, the Cinesamples company provide a full ‘CineSymphony’ orchestral range of brass, woodwinds, percussion and — you guessed it — strings, recorded at the Sony Pictures (formerly MGM) Scoring Stage in Los Angeles. 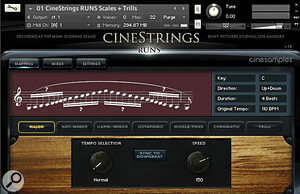 Cinesamples Cinestrings Core (which works with the free Kontakt Player 5.3.1) features large, vibrant–sounding sections playing a set of basic articulations such as short notes, sustains, four–dynamic legatos, the ubiquitous ‘Bartok’ pizzicato, col legno and tremolo. 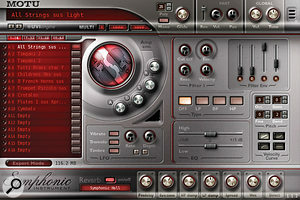 Features include the ‘Hairpin Creator’ tool, which automates tempo–sync’ed crescendos and diminuendos, and a set of unison and octave multis designed to create an instant big sound. 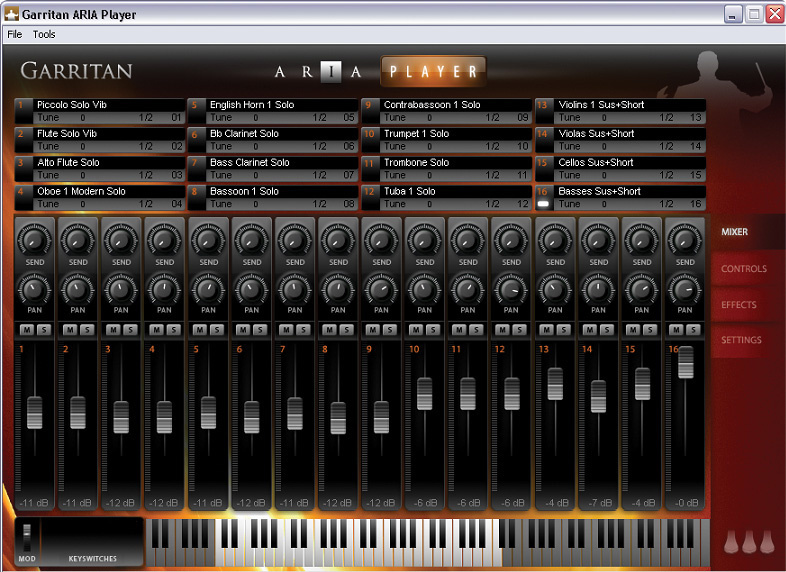 Blended full strings versions are provided for all articulations. 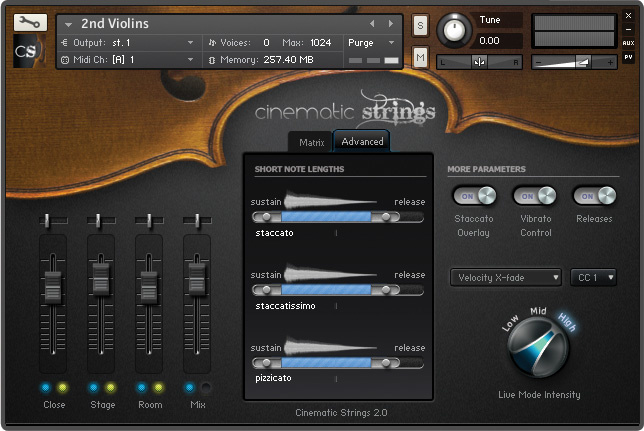 Cinestrings Pro, with extended articulations, is under construction. 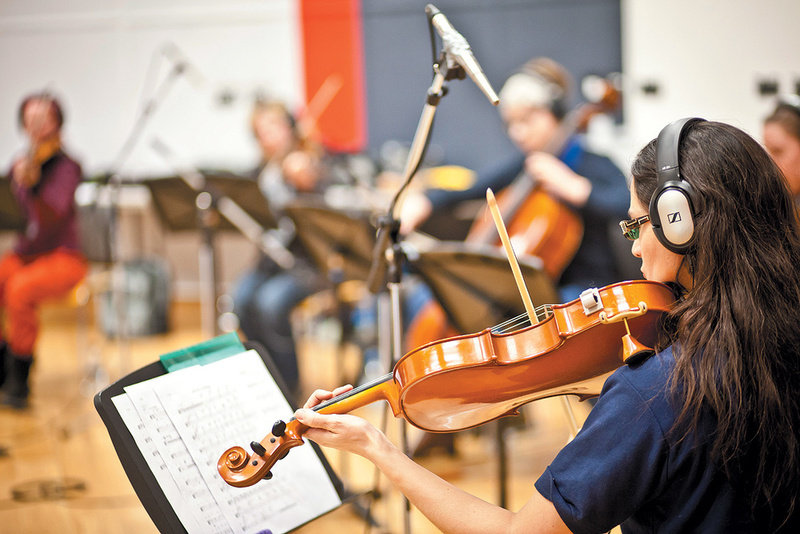 Kirk Hunter Concert Strings 3 takes a different tack : Mr. Hunter’s players were painstakingly recorded one instrument at a time in an LA studio with a live acoustic. Each section has a choice of four solo instruments, so you can program anything from a string quartet to a 16–piece ensemble, with total real–time control of section sizes. In the interests of authentic divisi writing, ‘Divisi Live’ technology automatically allocates the notes of chords to the correct number of players. 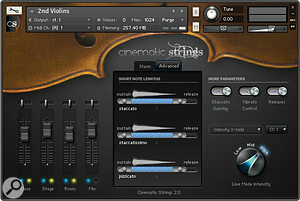 Available in various editions, Concert Strings 3 incorporates Kirk Hunter Solo Strings 3, which can be purchased separately; both libraries require the full version of Kontakt 5.3 or newer. At the time of writing, only first violins demos were available, but more extensive arrangements should have appeared by the time you read this. In a market crowded with Californian products, it’s refreshing to find a sample library recorded in Australia. Such a project is Cinematic Strings 2.0 , a joint venture undertaken by two composers on opposite sides of the world. 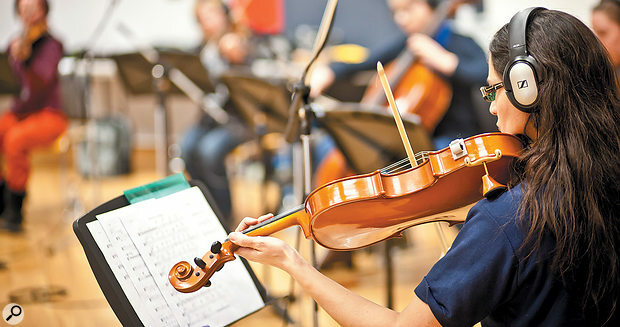 Forty players wield their bows in a modern, 500–seater Sydney concert hall, producing a big, high–quality and powerful sound which can be romantic or aggressive as required. All sections load with eight keyswitchable articulations in place: you can instantly switch the sustains between high and low left–hand playing positions, while cleverly programmed ‘Live’ and ‘Run’ modes add great realism to fast runs, arpeggios and 16th–note rhythm patterns. The straightforward presentation makes this library quick and easy to use. 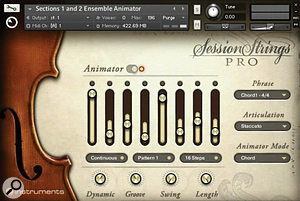 A souped–up and expanded version of Session Strings, Native Instruments’ Session Strings Pro is designed primarily for pop production. It contains four different small, studio–recorded sections presented as two linked pairs: sections 1 & 2 have a close, dry, tight sound, while sections 3 & 4 feature a more relaxed ‘classical’ miking. In addition to the usual orchestral articulations, a set of falls, scoops and fast glissandi recreate the lively, entertaining soul and disco string mannerisms of the ’60s and ’70s. The Animator step sequencer adds danceability by transforming held chords into user–programmable rhythm patterns or arpeggios. 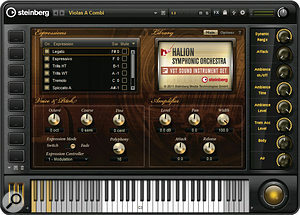 In addition to the stand–alone strings libraries described above, some companies sell mixed–instrument packages combining orchestral strings, brass, woodwinds and percussion. 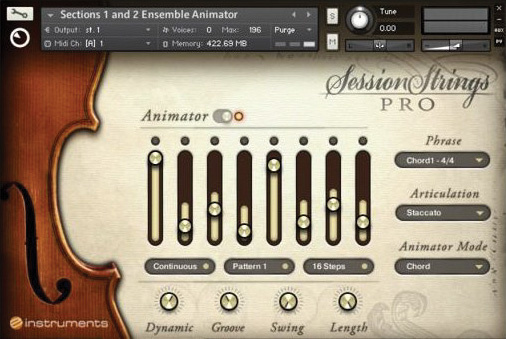 These libraries provide a convenient way of quickly creating orchestral mock–ups, though in the main they offer fewer options of instrumentation and playing style than the specialist string collections. An exception to this rule is VSL Special Edition, a budget–conscious set of six main volumes comprising 97 instruments and sections. While the collection offers a wide range of articulations, patches use fewer velocity layers and samples span a tone rather than a semitone — but nil desperandum, as they say in Hackney: the difference in sound is minimal. The strings can be bought separately, and expansion volumes allow users to add extra sections and articulations as needed; newbie buyers can start out with SE and upgrade to the full versions later. A big hit in its day, EastWest/Quantum Leap Symphonic Orchestra continues to top the charts: Sound On Sound’s readers voted it Best Sound Library in 2011, 2014 and 2015. Originally released in 2003 as a four–volume Kompakt set, it has now been formatted for EastWest’s Play engine, tweaked and re–launched as the all–in–one EWQLSO Play Edition. Recorded in a large, reverberant concert hall, the library is available in four editions ranging in size from the full Platinum Plus version (194GB) down to the 11GB Silver edition, with prices to match. The first orchestral library to offer surround–ready multiple mic positions, EWQLSO lacks interval–legato samples, but in all other respects it remains a top–notch collection. 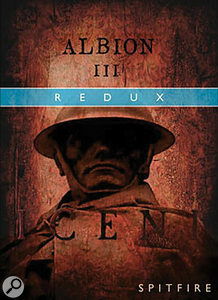 Spitfire Audio’s Albion is designed as a ‘broad brush stroke’ library for composers to sketch epic–sounding Hollywood–style film scores on a laptop computer. Blended instrument families are presented in high and low ensembles: high strings feature violins in octaves as well as unison violins and violas, and the low strings also have an octaves option. The instruments may have small articulation menus, but in AIR Lyndhurst’s hall they sound very big indeed. Winner of this writer’s 2013 ‘Most Eccentric Instrumentation’ award, Albion II — Loegria includes euphoniums, French horns, sackbuts (don’t ask) and recorders, and also a smaller (but still regal), more detailed string section. 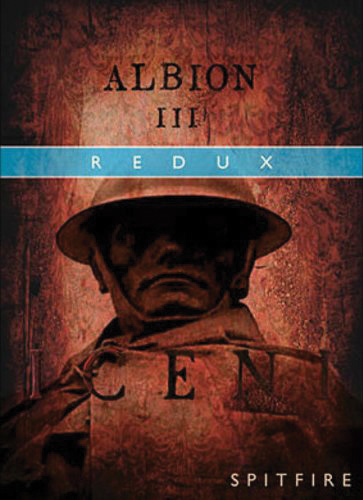 Albion III — Iceni aims to (in Michael Caine’s immortal words) “blow the bloody doors off” with thunderous low–pitched instrument sections, including a truly monstrous ensemble of 24 ’cellos and eight basses. A trio of libraries from Dutch samplists Project SAM offers ready–to–go, blended orchestral combinations. Symphobia contains separate brass, woodwinds and string sections, the latter featuring basses, ’cellos, violas and violins playing in unison according to range over six octaves. Seemingly of chamber proportions, these strings are tough and wiry rather than lush and romantic, but they still sound big, and play with plenty of aggression. 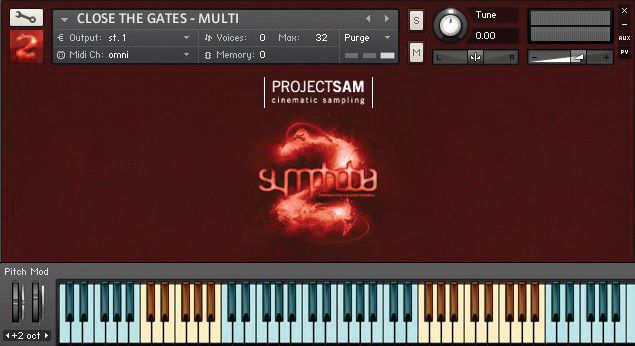 In Symphobia 2, which introduces true legato samples, different instrument families play together, with a new set of full string-section articulations (including bouncy short spiccatos and octave basses and ’cellos) also provided. Both libraries feature amazing ‘wild card’ effects and clusters, described at length in their SOS reviews. The ‘blended ensembles’ concept continues in Symphobia 3 — Lumina, which adds a choir, solo strings and woodwinds. 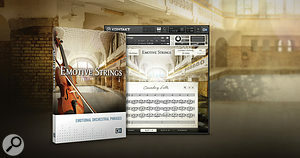 Also available from SAM is the Orchestral Essentials compilation, bringing together samples from the company’s Symphobia 1 & 2, True Strike 1 & 2, Orchestral Brass Classic, Woodwind Ensemble Orchestrator/Effects, Flute & Piccolo Effects, Organ Mystique and Concert Harp libraries in one convenient 6.5GB package. A second 9.5GB volume is now available, drawing on Symphobia 3 and other SAM orchestral titles. A more recent European contender, Sonokinetic Da Capo contains separate strings, woodwind, brass and percussion sections recorded in a concert hall. The strings are particularly strong, and benefit from legato samples. 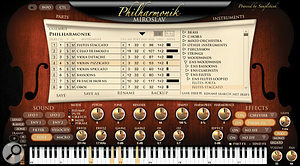 Instruments are blended into single playable patches, and although the orchestral instrumentation is incomplete, the simple playing styles work well for instant composition. Back in the USA, the large, elaborate Kirk Hunter Diamond full orchestra library (65GB) combines various incarnations of Kirk’s numerous products (including the Emerald collection, reviewed in SOS in March 2007). In line with Concert Strings 3’s flexible player numbers, Diamond’s strings come in solo, chamber, studio, concert and symphonic sizes. 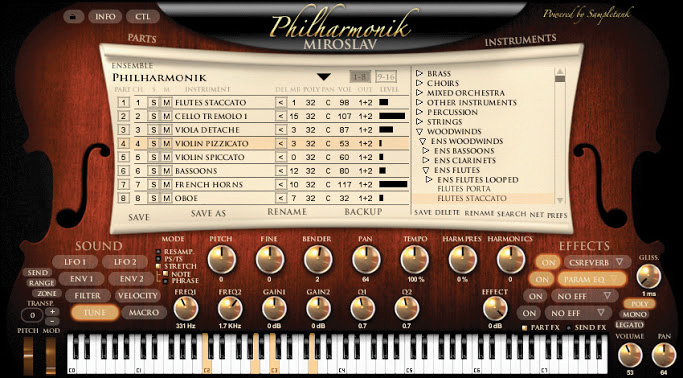 Two historic orchestral collections have been revamped for today’s virtual instrument market: IK Multimedia Miroslav Philharmonik repackages the maestro’s iconic, ground-breaking 1993 symphonic samples (including a choir) for the Sampletank 2.5 sound engine. A budget version, Miroslav Philharmonik Classik Edition, omits the choir and offers fewer instruments and articulations. The refurbished Peter Siedlaczek Complete Orchestral Collection includes the legendary 1997 Advanced Orchestra, now reformatted for Kontakt Player. Also included is Siedlaczek’s String Essentials, reviewed in SOS in July 2006. Miroslav Vitous’ and Siedlaczek’s libraries were the leading orchestral products of their day, and though lacking in modern deep sampling techniques, both feature some top–quality, highly usable instruments. Another classic sample collection from the hardware sampler era is the Prosonus library, now marketed by Big Fish. 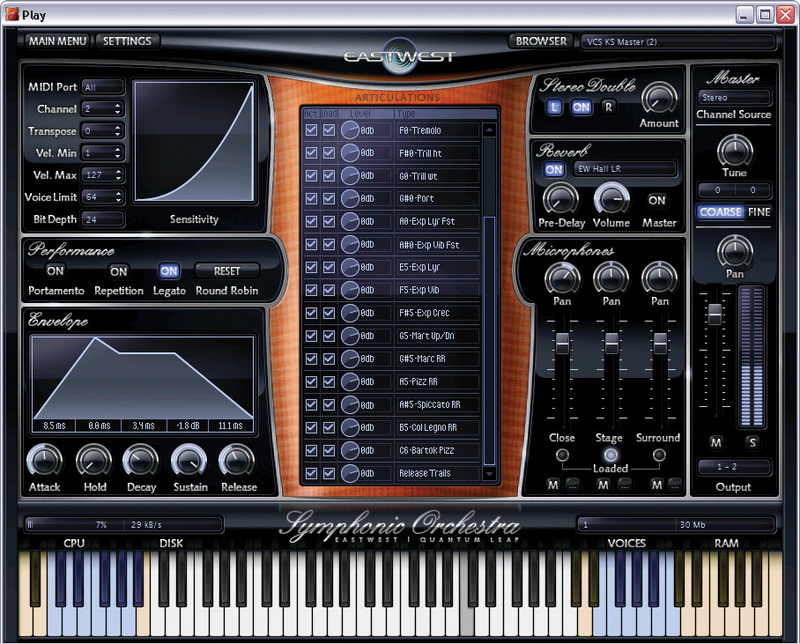 Their Orchestral Strings is currently available in Gigasampler and Kontakt 3 formats. Dating from 2004, the small, stripped–down but musically effective Garritan Personal Orchestra 4 offers an impressively complete instrumentation (including classy low strings and some rather good solo instruments), ensemble–building facilities and a user–friendly Aria player. Though not the most lush–sounding, it’s a convenient and affordable solution for cash–strapped composers, and a very good starting point for orchestral beginners. 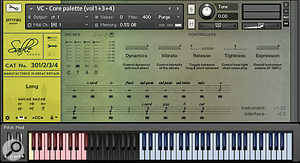 The MOTU Symphonic Instrument, originally released in 2005, works as a plug–in and stand–alone instrument, and its sound library can also be loaded into the MachFive 3 and UVI Workstation 2 sample players. A large instrumentation includes strings, brass, woodwinds, harp, pipe organ, pianos, children’s choir and some historic instruments. Though the string ensembles are reasonably plush, some drily recorded solo instruments sound synthetic. On the plus side, the wide range of timbres and numerous layering options open up exciting possibilities for live playing. Many of the above–mentioned stand–alone strings collections contain played octave runs, but if you’re looking for further performance options, a clutch of developers have taken it upon themselves to provide complete libraries of ready–made string runs and phrases. An early example of the genre, Peter Siedlaczek Smart Violins (2001) is a small (by today’s standards), Akai–era library, now reformatted for Kontakt Player and included in Peter Siedlaczek’s Complete Orchestral Collection. It contains 16 studio–recorded violins playing runs, phrases and ‘disco licks’ for pop and dance production; everything is conveniently played in all 12 keys, with fast runs and licks performed at three different tempos. According to the SOS reviewer, the performances are ‘unerringly precise’. A more recent and altogether more elaborate production is Orchestral Tools Orchestral String Runs, which features 50 string players from the Belarus Philharmonic performing a large collection of runs, figures, mini–phrases and straight notes in a large Minsk scoring stage. The phrases and figures are scale–based, so when you play a triad you hear a three–part parallel harmonisation in the scale of your selected key (good), rather than the same lick playing in three different keys at once (bad). 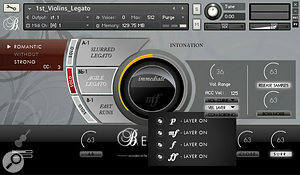 A set of legato short notes allow you to program your own fast runs, and impressive sustain and staccato multi–sample patches are also provided in case you suddenly become creatively inspired. 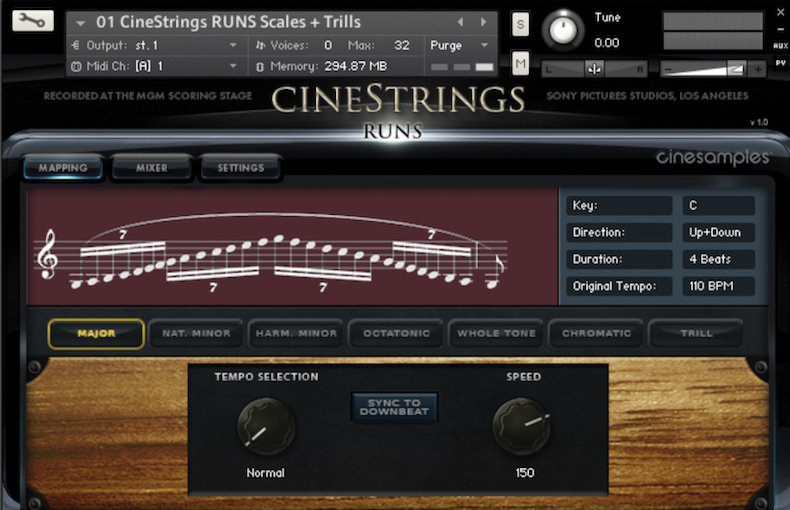 From the makers of Cinestrings Core (described earlier), Cinesamples Cinestrings Runs is a collection of violin section runs in a variety of scales and patterns, played in all keys and locked to your sequence tempo. The violins also play chordal trills and short rips. A cool ‘sync to downbeat’ function makes the run’s final note land on a downbeat regardless of when you play it (within reason — don’t expect it to land on the downbeat six months later). Neatly and logically presented, the mapping and musical content exactly matches that of Cinesamples’ excellent Hollywoodwinds, so owners of both can precisely synchronise their woodwind and violin runs. 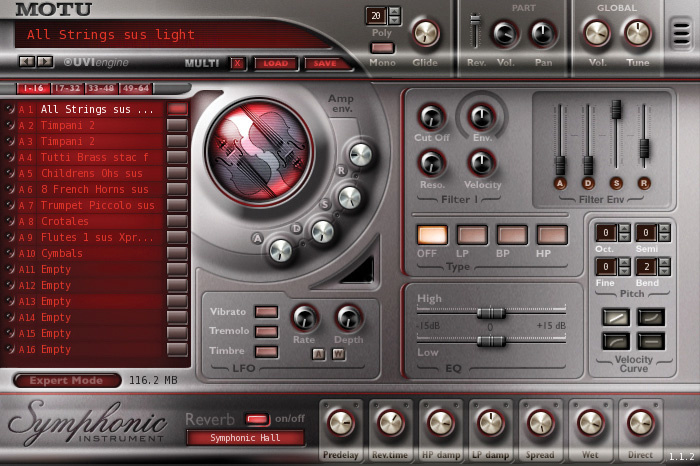 Over the last few years, the Netherlands–based company Sonokinetic have created several orchestral phrase libraries containing tempo–sync’ed strings, woodwind, brass and percussion patterns designed to work together or separately. The phrases (supplied in all keys in major and minor versions) were performed in a modern concert hall in Zlin, Czech Republic, and feature a large string ensemble of 52 players, along with other orchestral sections. Sonokinetic Minimal‘s phrases evoke the sound worlds of composers such as Philip Glass and John Adams, with lightly propulsive strings patterns (repeated single notes, 16th–note figures, quick repeated four–note runs, triadic arpeggios and so on) laced with classical–sounding licks. Low string patterns add power and gravitas to the syncopated rhythms. 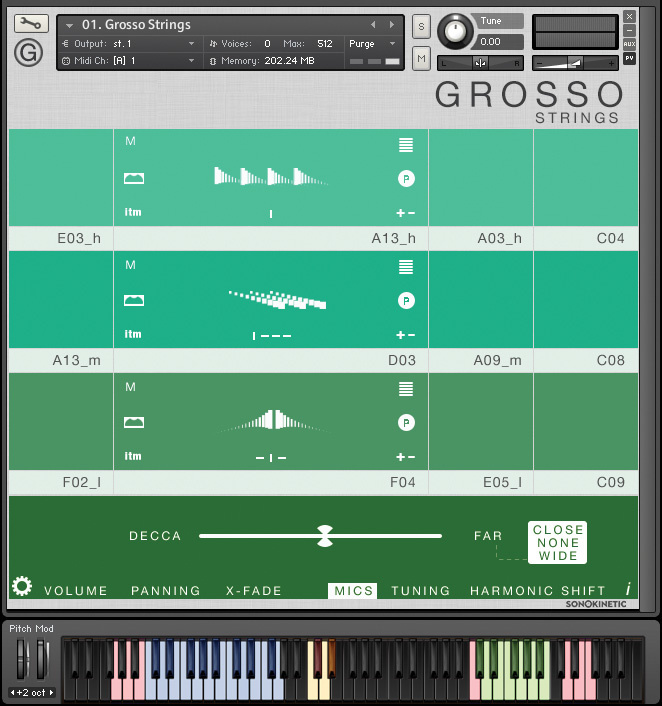 As the name implies, Sonokinetic’s Grosso sounds heavier and goes for an epic movie–score feel with driving ostinato patterns and colourful, decorative patterns and effects. Its phrases are written in 12/8 time, but they will adapt to 4/4 with a bit of fiddling (as explained in the SOS review). Sonokinetic Capriccio covers similar ground but aims for an even bigger blockbuster sound with a large selection of vigorous and forceful phrases, this time all played in 4/4. An earlier Sonokinetic release, Vivace, focuses more on orchestral effects and textures, but also contains some strings rhythm patterns lurking within its interior. For more big–screen strings–only phrases, meanwhile, check out Native Instruments’ Emotive Strings: these are more in a romantic, melodic legato vein, but also include ostinato patterns and Philip Glass–esque arpeggios. Mobile, heartstring–tugging violin figures are underpinned by a mighty low strings ensemble containing eight ’cellos and 10 basses. 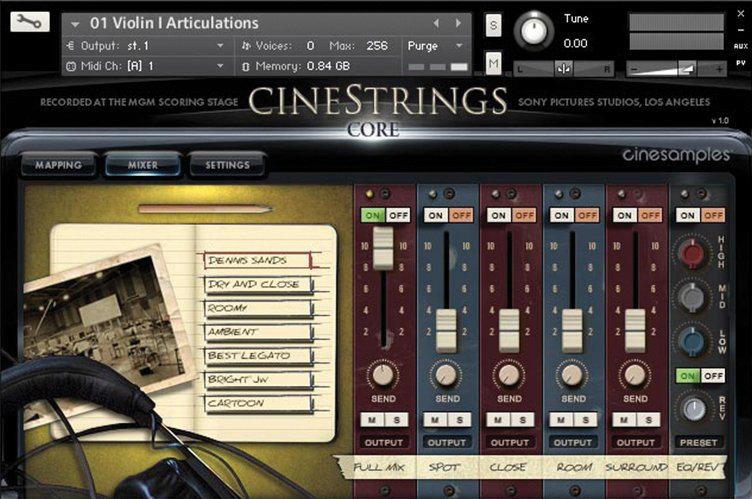 Native Instruments’ Action Strings occupies more Raiders Of The Lost Ark territory, so after you’ve scored a film’s love scene with a few well–chosen Emotive phrases, you can dial up some dramatic, galloping Action licks for the ensuing helicopter chase. Performed by European orchestral players and immersed in an expansive hall sound, the two libraries were produced by the German company Dynamedion. OK, I hear you cry, I’m still confused: which library sounds the best? Fortunately, you don’t have to rely entirely on what you read here: all the orchestral sample developers have demos and video walkthroughs on their web sites, so you can hear for yourself what their wares really sound like, and get a glimpse of how the libraries’ controls work. You’ll also find patch lists and system specs on these web sites, enabling you to make exacting comparisons. The good news is that, whatever your personal choice, orchestral strings libraries have greatly improved since their inception in the early ’90s, and with their expanded velocity layers, round robins, multiple mic positions and conducive playing styles, today’s products sound a lot better than their 20th–century equivalents. In particular, the high musical and technical standards of the stand–alone strings libraries listed here guarantee a professional level of sound quality and functionality. The ingredients are all there: the rest of the job — whipping the samples up into fabulously tasty orchestral arrangements — is up to you! The figures below show the vital statistics of our selected libraries. ‘HD space’ refers to their total size in gigabytes (including all volumes) when installed on your hard drive; section sizes show the full ensemble numbers of (respectively) first violins, second violins (where available), violas, ’cellos and double basses. ‘Mics’ shows the number of different microphone positions used, excluding any mixes. ** Includes different and/or configurable section sizes. # Violins, violas, ’cellos and basses separately available. ~ Ensembles consist of layered solo instruments. + Also contains brass, woodwind and percussion phrases. % Also contains tutti phrases. Now incorporated in Peter Siedlaczek Complete Orchestral Collection. Full libraries: Solo Strings I €$570, Solo Strings II €$390, Chamber Strings I €$650, Chamber Strings II €$350, Orchestral Strings I €$690, Orchestral Strings II €$590, Appassionata Strings I €$590, Appassionata Strings II €$370, Dimension Strings €$1190. Special Edition Vol. 1 Strings €$130, SE Vol. 1 Strings Plus €$130, SE Vol. 2 Strings €$105, SE Vol. 2 Strings Plus €$105, SE Vol. 3 Strings €$345. Composer Cloud: seven libraries of your choice €27.99$29.99 per month, or all EastWest libraries €45.99$49.99 per month. EWQLSO Play Edition Platinum Plus €670$745, (Platinum) €599$675, (Gold) €335$375, (Silver) €170$195. Mural Symphonic Strings Vol. 1 £478.80£399 (approx $610), Mural Symphonic Strings Vol. 2 £478.80£399, Mural Ensembles £238.80£199 (approx $300), Sable Strings Vol.1 £478.80£399, Sable Strings Vol.2 £478.80£399, Sable Strings Vol.3 £358.80£299 (approx $456, Sable Strings Vol.4 £178.80£149 (approx $230), Sable Ensembles £298.80£249 (approx $380), Albion I £418.80£349 (approx $530), Albion II — Loegria £394.80£329 (approx $500), Albion III — Iceni £406.80£339 (approx $515). Session Strings Pro £249$299, Emotive Strings £249$299, Action Strings £249$299. Symphobia £488.02$699, Symphobia 2 £488.02$699, Symphobia 3: Lumina £488.02$699, Orchestral Essentials £256$349, Orchestral Essentials 2 £256$349. Da Capo €241.88 (approx $260), Minimal €241.88, Grosso €362.88 (approx $400), Capriccio €362.88, Vivace €241.88. Adagio Violins $399, Adagio Violas $299, Adagio Cellos $399, Adagio Basses $199, Adagietto $399, Agitato String Bundle $299. 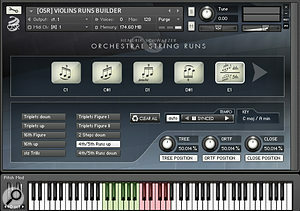 Berlin Strings €840 (approx $902), Orchestral String Runs €260 (approx $279). Cinestrings Core $499, Cinestrings Runs $149. GarritanPersonal Orchestra 4 £115. $149.95. You can read the SOS reviews of the selected strings libraries online, where available, via the links below. Reviews of products which have undergone radical make-overs since their first incarnation, such as EWQLSO and the pre–2006 VSL releases, contain links back to their initial reviews. 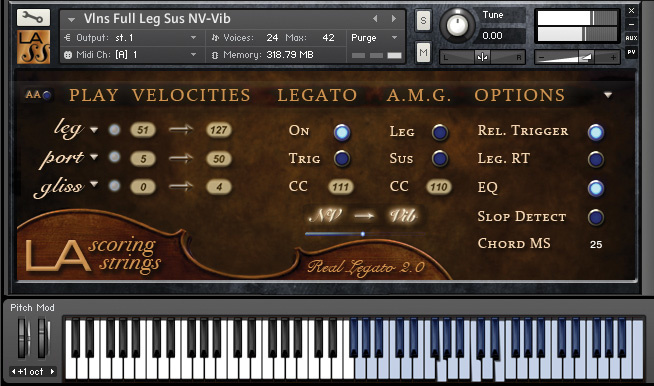 An important milestone in orchestral sampling occurred in 2002 when Vienna Symphonic Library unveiled their revolutionary ‘interval legato’ concept. This technique (described in the SOS review of VSL First Edition: www.soundonsound.com/sos/may03/articles/viennasl.asp) gives staggeringly effective musical results — for the first time, melody lines sounded smooth, flowing and properly ‘joined up’. A variant on the theme, legato portamento, accurately emulates the sinuous pitch slides of Indian ‘Bollywood’ pop strings to great effect. At the same time, VSL introduced a ‘multiple note repetition’ feature where repeated keystrokes triggered different performances, in order to avoid the telltale ‘machine gun’ effect of a constantly repeated sample. (Nowadays, such note repetitions are referred to as ‘round robins’.) 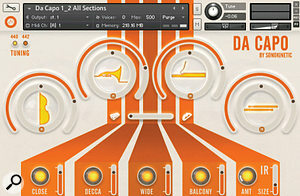 These techniques significantly advanced the realism of sampled instruments, and have subsequently been universally adopted by sample developers. For that reason, this product roundup focuses on string libraries dating from 2002 onwards which incorporate these techniques.